OGCA has adopted a Project Lifecycle management approach that encompasses all aspects of sponsored project administration. This means that our office is now organized to manage projects starting at the inception of an idea and finding a funding source, through writing and submitting a proposal, to management of the award and closing out the project, where the process begins anew. 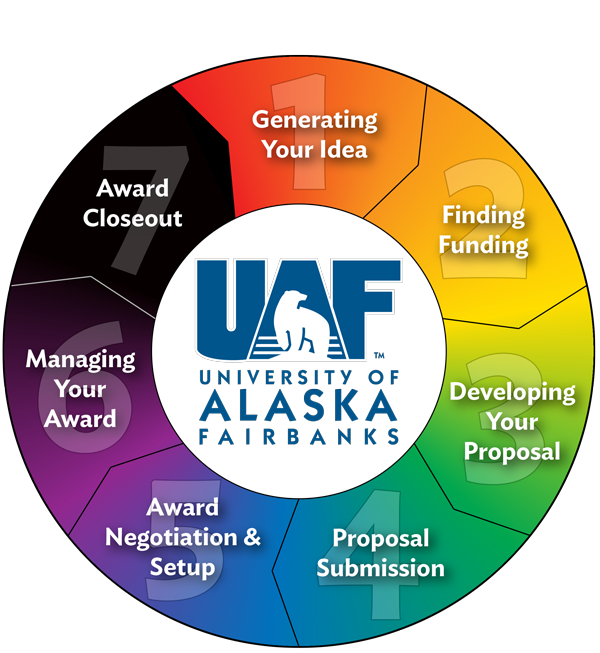 UAA, UAF, and UAS have committed to adopting a unified business model utilizing the lifecycle concept that embraces operational effectiveness through efficiency, accountability, transparency, and responsiveness to the needs of the campus communities and the external partners with which we do business. Click on a lifecycle phase for policies, procedures, forms and other tools related to that stage of the project.